Dnepr, which is the Russian name under which Dnipro became famous in USSR times, were Ukraine's second most successful club before independence, winning all their titles in the eighties, the decade they made a name for themselves at international level as well. Ever since, they have established the name Dnipro as a top club in the country, earning more international credits with their spectacular 2014-15 UEFA Europa League campaign. Founded in 1918 as BRIT, initials that stand for the Russian words “Bryansk Worker Industrial College”, the club went on to change their name to Petrovets, Stal, and Metalurh, until 1961, when Yuzhmash, one of Soviet Union's (and today's Ukraine) most powerful factories took over, and changed the name once again. Despite having such a powerful backer, Dnepr, named after the river that runs through the city (and the entire Ukraine), failed to reach any noteworthy success in the sixties. The seventies looked promising, the club reached the Final of the USSR Cup twice (losing both times), but just before the turn of the decade, the two steps forward they had made, were followed by one major step backwards, finishing 16th in the Championship and being relegated. Perhaps that was the shock Dnepr needed to really shake things up. In 1980 they returned to Soviet Union's top league. When that decade was over, led by legendary players like Oleh Protasov and Hennadiy Litovchenko, they had transformed themselves from a mediocre team to a title-winning club, putting Dnipropetrovsk on the map at international – football – level as well. In 1982 they reached the USSR Cup Final again, and even though they lost, they gave a taste of what was about to follow next year. The end of the 1983 season found Dnepr crowned champions for the first time in their history. Next year it was time to shine in Europe, reaching the quarterfinals of the European Cup (today's UEFA Champions League). Having earned a spot in Soviet Championship's top three in back to back years, Dnepr pushed on, and in 1988 they won their second title, also reaching another – lost – Cup Final. The club's most successful decade came to an end with another run to the European Cup's quarterfinals, a second spot in the Championship, and, finally, a USSR Cup title. 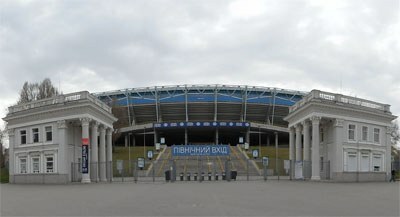 Following Ukraine's independence, Dnepr became Dnipro (the Ukrainian name of the river), and red was substituted by blue and light blue as the club's colours. 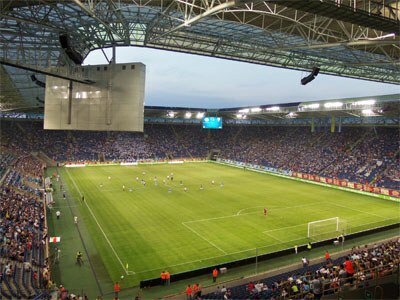 Several years later, in 2008, they became the first Ukrainian club to get a truly modern football-specific stadium, Dnipro-Arena. Despite not having won a single title since independence, they have earned an undisputed spot in the country's top 5, being an almost constant thorn on Dynamo Kyiv and Shakhtar Donetsk's side. Plus, in 2014-15 they emphatically reminded Europe of their existence, playing some amazing football on their way to the UEFA Europa League's Final, where they dramatically lost to Sevilla. The capital letter “D” has been in use since the early sixties, when the club was renamed Dnepr. Following Ukraine's independence, Dnipro, the name of the Dnieper River in Ukrainian, took (Russian) Dnepr's place. The boat is a 1987 addition.